In the fight to put a public option of the Affordable Care Act, many missed that the law contained a historic boost to Medicaid, our single-payer health insurance program that covers the poorest and most vulnerable Americans. Obamacare was set to cover 17 million additional Americans, as many as 670,000 in Michigan, who earn up to 133% of poverty level. Until 2020 the federal government pays for 100% of this expansion using tax increases on the richest 2% to fund it. After 2020, states will have to kick in a mere 10%. Unfortunately, when the Supreme Court ruled that ObamaCare was legal, it also gave states the right to opt out of the program. So far nearly a dozen states with Republican governors have turned down this coverage. That’s right: Medicaid expansion is the best thing to happen to America since Medicare. It saves all Americans by extending public health insurance to Americans who work hard enough to get just above poverty paid for by taxing the richest 2% yet Republican governors are turning it down just because they can. Turning down Medicaid expansion hurts everyone. The poorest Americans are already covered by Medicaid. This program helps those who are already working hard in some of the hardest jobs in America — janitorial, child care, construction — afford health insurance. And when they’re covered, insurance companies and hospitals can’t pass the costs on to the insured. In Michigan this can save those who purchase private insurance up to $985 million in the next 10 years. Michigan needs Medicaid expansion and we voted for it in November when we reelected President Obama. 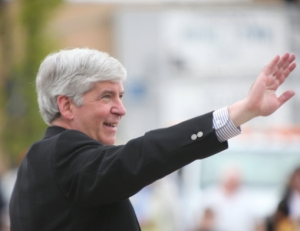 Sign this petition now and let your friends and family know that you won’t let Governor Snyder hurt our economy and our families by saying “no” to Medicaid. Here’s a look at which states are hurting their citizens by turning down the best thing to happen to America since Medicare.